The recent capture of the world's biggest drug kingpin, Joaquin "El Chapo" Guzman, was heralded across the world as a major triumph over the drug cartels, but the fact that it was carried out by the Mexican navy - rather than by police forces - should make us skeptical about its significance. Guzman was captured by an elite team of the Mexican navy with the help of U.S. intelligence agencies in a pre-dawn raid in the beach resort town of Mazatlan. He was flown from there to a navy hangar in Mexico City, where Mexico's attorney general gave a news conference to announce his arrest. But the fact that Guzman's capture was a top-down, in-and-out raid by navy marines, in which neither police forces nor local law enforcement authorities had much participation, is a bad sign about Mexico's ongoing war against the drug cartels, well-placed security experts tell me. "To defeat the drug cartels, you need good local police forces, and that's where we have our biggest problem," says Eduardo Guerrero, a security consultant who until recently worked for Mexico's public security and intelligence agencies. "The fight needs to start at the bottom." Local police forces are the first circle of contact with the drug cartels, and are the key to dismantling them, he explained. But Mexico has more than 2,000 police forces, including the Federal Police, 1,800 municipal police forces, 32 state police forces, and various banking, road, tourism, and customs police forces, which in most cases are poorly trained, badly paid, and penetrated by organized crime. Most local police chiefs are political appointees - often relatives or friends of a governor or mayor - with no law enforcement experience. And despite the creation of a handful of police academies in recent years, most local police agents receive little or no training, and get starting salaries of about $1,000 a month. Asked whether the arrest of "El Chapo" Guzman will have a devastating impact on his Sinaloa drug cartel, most experts agree that it won't. Many other cartel bosses have been captured in the past in similar raids by the marines or the army, only to be replaced by their second in command, or by whoever wins internal wars to succeed him. "El Chapo" Guzman will most likely be replaced by the Sinaloa cartel's No. 2, Ismael "El Mayo" Zambada, law enforcement sources say. 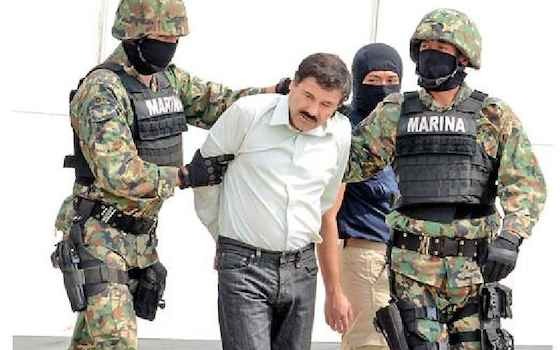 Government officials say "El Chapo's" arrest was a major coup in the fight against the Sinaloa cartel, among other things because it will give authorities priceless intelligence that will help nab other cartel members. Also, the widely publicized capture of the world's richest drug kingpin will help fight the perception that the drug lords enjoy impunity, they say. Aurelio Nuno, the chief of staff of Mexican President Enrique Pena Nieto, told me in an interview that Mexico is working to consolidate the estimated 1,800 municipal police forces into one single police force for every state. But he conceded that it may take years. "It's a long and complex process," he said. My opinion: The arrest of "El Chapo" Guzman was a major propaganda coup for Pena Nieto, but it's a mostly symbolic victory in the war against the drug cartels. Perhaps one of the most revealing things we have learned after his capture was that, contrary to reports that he had been hiding in Argentina or another Latin American country after his daring 2001 escape from a Mexican prison, he had been living comfortably in Mexico for the past 13 years. What's more, "El Chapo" Guzman allegedly used to dine at fine restaurants with dozens of friends and relatives at a time. He obviously enjoyed the protection of local law enforcement, and so did his underlings. I will start believing that Mexico is making headway in defeating the drug cartels the day the country streamlines its 2,000 police forces and creates a professional career service for all police officers. So far, the Pena Nieto government's plan vow to unify and professionalize municipal police forces is similar to the plans announced by every new Mexican government in the past two decades, with no results in sight. Until we see police forces on the front lines in the war on the drug mafias, we will continue seeing Hollywood-styled raids that will occasionally capture a big cartel boss, but will not make a major dent on criminal organizations. "What's Wrong About 'El Chapo's' Capture"